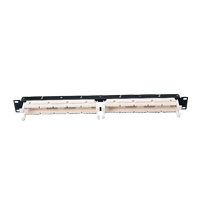 Complete S210 installation kits include S210 wiring blocks with detachable legs*, S210 connecting blocks, and label holders with white designation labels. *Legs detachable on 64-pair version only. 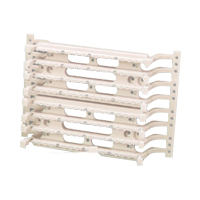 S210 panels allow wiring blocks to be mounted directly to a 19 inch rack or cabinet. 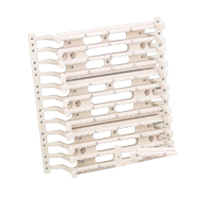 Includes the appropriate quantity of S210 connecting blocks, mounting hardware & label holders with white labels. Openings between rows allow horizontal cables to be routed from behind the panel & enter the block from the rear, maintaining cable jacket & twist up to the point of termination. 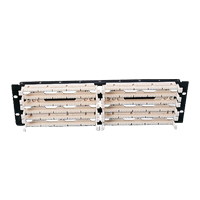 S210 panels allow Siemon’s S210 wiring blocks to be mounted directly to a 19 inch EIA rack. 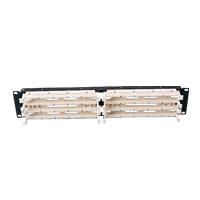 These panels represent the ultimate “universal” category 6 rack mount connecting hardware solution as they readily support both voice and data connectivity. Each location can be cross-connected for voice applications or patched to adjacently mounted active equipment to support data applications including VoIP.